The picture and colors is true to the picture online. I love it but unfortunately the box was damaged and one of the pictures was also damaged. I will reorder. 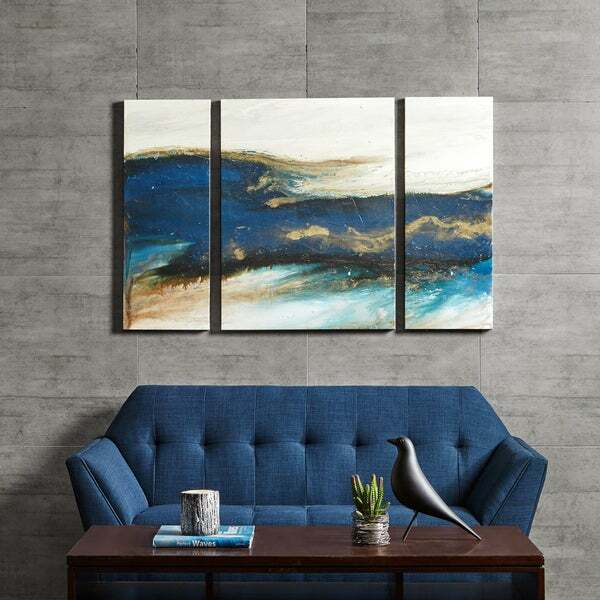 Rolling Waves is a triptych set that features a cool and tranquil abstract piece. The three-piece set incorporates a deep and rich navy, crisp white, and hints of gold to give it added style. The art is printed on canvas and lightly gel coated for texture. Absolutely beautiful. Works perfectly in my space. I had planned to break them up to hang the two skinny pieces together and place the large piece on its own. It worked out to be stunning and I get a TON of compliments. Looks good online and even better in person. Thanks Overstock!!! Just received Rolling Waves 3 piece canvas set. It arrived in good condition, even though there was a hole in the box. There is a lot more dark blue color and a lot less gold than the one shown on line, and no texture. Taking a few days to think whether I'll keep it or return. Nice canvas. Appreciated the gel coating. But darker than pictured. Returned. The Colors and style just as pictured. Goes great above the royal blue modern sofa in the room. It does not have a lot of texture more of a giclee or digital print but adds a beautiful touch of color and art needed for the finished basement. Very happy with this, it is interesting and pleasing and there is a textured brushstroke effect that gives the canvas a high end look. Initially I was sent two end panels and a middle. However, Overstock rectified the issue immediately and sent me out another. It is perfect! So beautiful. I love the rich tones and it is not your typical seascape. Gold and deep blues so lovely. A very beautiful piece. The dark colors mixed in with hints of teal allowed me to bring in bright accent pieces in my bedroom, which has a navy bedspread. Recommended! It matched our 8x10 rug, we bought from Overstock, Perfectly!! Looks very nice where I hung it, only problem is the light from a nearby window causes a glare on the coating and makes it difficult to see. I guess it's still pretty most of the day, but midday it is hard to see... Colors are nice, works well with my furniture and other decor. I'd buy it again, the painting is very nice, it's my location that is sub-par. Great canvas! Works really well in our office setting with all our other décor as it is neural enough but also provides some visual interest. These panels have more gray than white and aren't as pretty as in the picture. They just feel flat and uninspired, unlike in the photo. I ordered this to go above my navy blue couch (very similar to the picture) and it looks fantastic! Let me say first off picture was well packed and very easy to hang. The quality of the canvas was pretty good and the color was exactly what you see. Colors weren't quite what I expected but it still looks good. Colors are somewhat muted, the white in the picture is more of a cream/beige color. Still works for what I needed it for but a more realistic product image would have helped! Hung this above my daughter's sofa in her apartment. Looks great! The original arrived with two of the left panels (instead of a left and a right), but Overstock quickly sent a replacement and problem solved. I am not sure. It may not work for my bedroom wall but I wanted to see. "What are the overall dimensions of this product?" This set measures approximately 32 inches H x 48 inches W x 1.5 inches D.